Our partnership with Leeds Rhinos Foundation offers a cancer rehabilitation programme to support cancer patients in Leeds and beyond. The FREE 12 week Active Beyond Cancer programme is delivered in three venues across Leeds – at Armley, Rothwell and Fearnville leisure centres. The programme is open to patients at different stages of cancer treatment. Its aim is to help people recover and live well after cancer by offering free health and fitness coaching and advice to increase levels of physical activity and improve confidence. The sessions focus on improving the health and wellbeing of attendees, and include a series of talks on living a healthy lifestyle and eating well, alongside practical exercise sessions. These include everything from circuit training to taster sessions in Thai Chi, ballroom dancing and chair gymnastics. When someone is diagnosed with cancer, eating well and exercising is often the last thing on their mind. But research suggests that being physically active can help conquer common side effects of treatment, such as fatigue. Being physically active can lead to a boost in energy levels, improved quality of life and for some cancers research shows that it can help prevent the cancer from coming back. The partnership also includes health checks at Leeds Rhinos rugby matches and education in schools. Through programme adverts and monthly campaigns at Headingley stadium the partnership also raises awareness of signs and symptoms of cancer and the importance of healthy lifestyle choices. 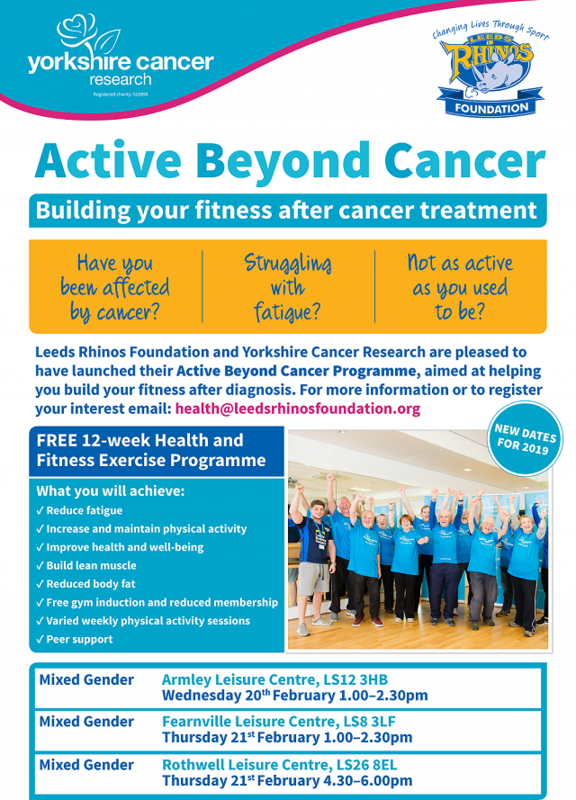 For more information and to register your interest to take part in the next Active Beyond Cancer programme, please email health@leedsrhinosfoundation.org.